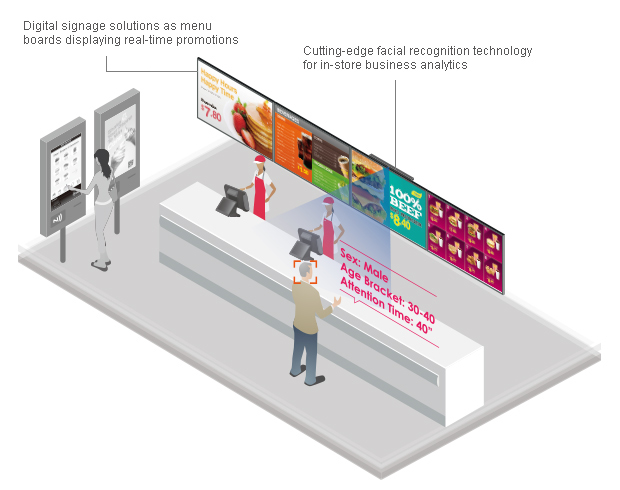 Increasingly quick service restaurant (QSR) operators are considering implementing digital signage to enhance customer engagement, convey brand messages, simplify the ordering process, and make inventory management more effective. As customers walk into these restaurants, they expect to see the latest promotions on digital menu boards and self-service kiosks. Going digital has enabled operators to change menu items and prices quickly and easily, not to mention more that these displays are more eye-catching than static menu boards. Also, when it comes to drive-thru menu boards, it presents a great opportunity to inform customers of everyday value and share the latest promotions. Therefore pre-sales menu boards and order confirmation systems improve order accuracy and efficiency at QSRs. With so many in-store distractions, it‘s sometimes difficult for customers to focus on what the QSR is advertising. However, digital menu boards are able to catch customers’ attention and deliver a clear message. NEXCOM Digital Signage Solutions provide reliability and expandability, NDiS M535 allows multiple displays side by-side (in portrait or landscape mode) playing HD video and pictures. Users can implement dayparting presentations in independent, clone, or 3x1 video wall modes. The central server can be remotely updated with menu schedules for real-time promotion, regardless of location. In addition to being a menu board, it can also be used as a pre-sales advertising tool. For example, in waiting areas, digital signage can act as a single-source display to broadcast advertisements or upcoming events. The OPS design of the NDiS M535 simplifies installation and maintenance. A uniquely designed Gigabit LAN port enables remote management with content upgrades and remote BIOS maintenance, thus ensuring uninterrupted operation and lowering labor costs and repair time. For an enhanced customer experience, NEXCOM offers an integrated cutting-edge facial recognition solution which allows the system to offer a customer‘s favorite menu, improve customer satisfaction, and create an interactive dining experience. The NDiS B535 is another box PC option for QSR. Powered by a Intel 6th Gen Core processor, the NDiS B535 can offer impressive system performance and full HD videos. With support for 4K2K video playback on three independent HDMI outputs the NDiS B535 can fully satisfy customer‘s expectation and be used in applications such as advertising, hospitality, brand promotion and digital menu boards. Going digital enables stores to change menu items and prices quickly and easily. The NDiS B series offers impressive system performance and 4K support for ultra HD video contents on three independent displays. For QSR, the high-performance NDiS B series, such as NDiS B535, can also be used as a microserver to evaluate shopper engagement, visit-to-purchase conversion rate, and operational efficiency. NEXCOM’s NDiS M series is made up of OPS media players intended to save engineers the time and effort associated with wiring power cords and signal cables, allowing for quick and frictionless installation. As to operational efficiency, the NDiS M series enables QSR to launch a nationwide or regional campaign by simply updating contents to local stores from a central office. With integrated facial recognition solutions, the NDiS M media players can offer a customer’s favorite menu, improve customer satisfaction, and create an interactive dining experience.